There are many courses on offer for all different sorts of training in South Africa and many of them are not good. Often people choose a course on price, not on quality. Often other people and organisations devise "courses" or leaflets that are totally inappropriate for the learner. It seems that this is of big concern e.g. in the field of HIV-Aids aware-ness. People set up courses as business ventures, not primarily to help people in need. Children of Fire is a small charity that works with St John Ambulance - a massive charity. We work with a giant because it has tried and tested first aid courses that are recognised for their quality all over the world. 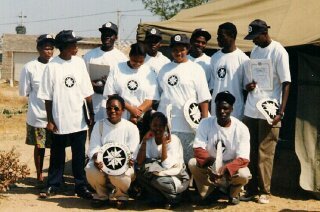 St John Ambulance has helped us to run training courses during 2000 and 2001, in squatter camp shacks, army tents, remote classrooms and now in police stations. St John Ambulance provides trainers who can speak the first language of the participants, even though the training itself is primarily in English. It uses a lot of videos and simple diagrams to help people remember the key points of training. And practical splinting, bandaging, resuscitation and role-playing ensure trainees are really ready to help in an emergency. A good training idea from overseas: In the UK the government established a system to encourage people to value life-long learning, called Individual Learning Accounts (ILAs). These were available to help any adult who wanted to train either in work they already did or on any course that would help make them more employable. The government met the cost of the courses or part of the cost. The same funds were available to anyone, without a means-test. The ILA started last year and was working well. But the Head Of Learning Services at the Trade Union Congress (like South Africa's Cosatu) says that ILAs have just been suspended because of the "aggressive selling and poor quality of some of the learning offered by a number of providers". As the UK government could not find an administrative way to end these practices (see www.dfes.gov.uk 'Latest News'), a good idea has stopped. 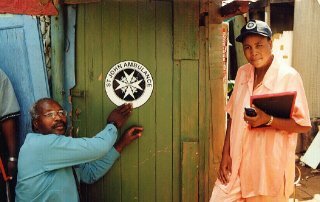 Taking us full circle, that is why Children of Fire likes to work with St John Ambulance. It is not a fly-by-night organisation, it is not in it for the money; but it is a charity with 900 years experience today being used to help us to make a difference, Together in Alex. 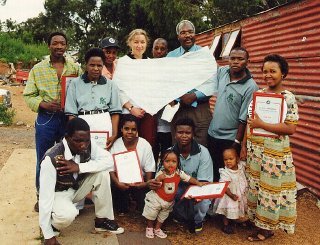 In 2000, Children of Fire started teaching people in squatter camps about First Aid. While we had already taught people basic survival tactics in the event of fire or other burns injuries, it became apparent that First Aid skills were needed within the community. This is because people don't have ready access to phones (usually cellphones or nothing) to call for help; South Africa's emergency services are severely understaffed, under-equipped, demoralised and underfunded and so often cannot react to an emergency in time; emergency services often don't want to go right inside a squatter camp because the situation can range from unpredicatable to volatile; the emergency services often don't have up-to-date maps to even show where the squatter camps are - let alone what they are called; and the First Aid knowledge itself could have a preventative function. (It should be noted that in Cape Town there is a numbered panic button system that is quite effective at summoning help, even more so than telephones. The panic button system is not effective elsewhere in the country). Rather than reinvent the wheel, Children of Fire teamed up with St John Ambulance - a 900 year old charity that teaches First Aid for schoolchildren right up to First Aid for paramedics. Squatter camp trainees were selected with at least Standard Seven education (lower than 'O'-level) and the ability to read and write in English. Everyone was learning in a second or third language and videos became an essential aid to overcome linguistic problems. But running videos in squatter camps requires a source of electricity (hiring a generator) and security for the owner of the equipment. We tried to select a group that included people in their 20s, 30s, 40s and 50s as well as a balance between men and women. If we had only trained people in their 20s, as they were the most likely age to find employment, they would not have been available to help if someone was injured in the daytime. Most of the trainees had been out of formal education for some time and found it hard to start again. They were given frequent breaks with snacks, and plenty of practical work bandaging each other, as well as lots of visual aids. In each location Children of Fire continues to foster team spirit among the trainees - most of whom didn't know each other before starting the course. It was inevitable, with most families now having at least one person sick with AIDS and often only one wage earner or pensioner supporting an unreasonable number of people, that trainees applied for the courses in the hope that the certificates would enable them to find work. Children of Fire emphasised that any further education helps in the job market but that the charity's objective was first and foremost to prevent or to minimise injury. The first training course was run in a large tin shack (the creche) in the Joe Slovo squatter camp in Johannesburg. The second training course was run in an Army surplus tent in the massive Diepsloot squatter camp, 35km from Johannesburg. Petty Ndaba, the trainer from St John Ambulance, was then put through Children of Fire's firefighting training, to encourage further co-operation and skill-sharing between the organisations. The other trainees found it a little strange to have their trainer becoming a student alongside them. 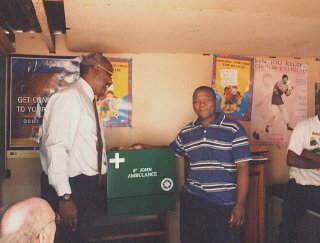 One of the most exciting outcomes from the training to date, was when the First Aiders at Joe Slovo squatter camp decided to build a clinic. Children of Fire had offered that if the trainees removed a shed that was no longer needed in the nearby suburb of Melville, they could do what they wanted with the material. We had assumed that they would simply sell it for cash, but instead Mlungisi Cakile and Collin Mudau built a little clinic. It might not look much more than a tin shack, but it is proof that the people even on the lowest rung of the economy are prepared to help themselves; proof that training, and fostering morale, reaps dividends. They have a bed, a full St John First Aid kit, and keep a notebook to show who they have assisted or counselled, on a daily basis. The First Aiders are not paid for this work. They now want a stretcher so that they can bring injured people out of the squatter camp to a place where the emergency services are less afraid to tread. Mlungisi proved his own mettle within a mere two weeks of his initial training - by saving three lives and at the same time proving the viability of training that costs some R500 per person. Children of Fire will run more First Aid training in 2001. It is also looking to supply small first aid kits to trainees, that will cost about R54 each if bought in sufficient quantity.